Sounds easy and delicious! I've never had anything like that before, but I'd love to give it a try. Thanks! It's little different from ordinary macaroni salad that I used to have when I get here. It's good:) Thanks! Sarap! 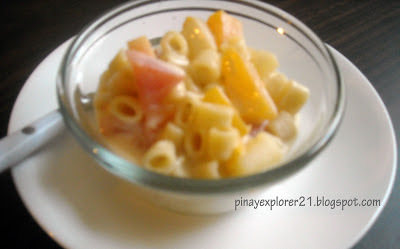 How I miss this Filipino style mac salad! It taste good too, Thanks! Ooh..the macaroni looks super yummy.. will have to try out this type of salad one of these days. 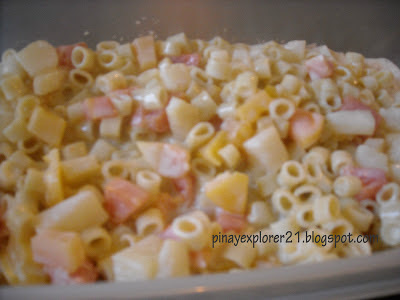 Macaroni salad is one of my favorites!!! =p~ Penge! It's been a while since I made this. I would make this again soon. Wow ang sarap nyan.. My Mom and my MIL's favorite..
Melgie, looks yummy! Hmm, by the way, the bowl looks small for me hehe. Macaroni is one of my faves! Hmmm yummy! Looks easy to make. I would try to master this since wifey is an expert of fruit salad. hahaha. I do not make this (although I love it) because mayonaise could be expensive. But you can add it to nestle cream and condensed milk pala. only few ingredients for very filling merienda. Thanks! Oh, we cook this type of macaroni dish, too! Delish! something like that, Thank you! another simple but delicious recipe! thank you! This is just in time. I am thinking kasi of a desert for my son's birthday party on Sunday. If not macaroni salad, pwede din fruit salad. Or kung wala time, ice cream na lang hehe. I love macaroni salad next to spaghetti, hehe. My kiddies birthday party on Saturday.. nice! sarap naman, Thanks! different version ito...but looks good, sarap! Melgie , I haven't eaten macaroni salad for quiet sometime :P Would you mind throwing a bowl or two over here ? lol Simply delicious !